The way pork – whether it be fresh or cured – sizzles in a frying pan, releasing its mouth-watering aroma and slowly crisping into something truly wonderful is one of life’s great pleasures. But when you transfer the meat from the hob to the barbecue, things get a lot more interesting. Barbecued pork is full of smoky, sweet flavour and is one of the first things to be snapped up by greedy fingers. It’s also one of the most versatile things you can throw over hot coals, as it absorbs marinades and spice rubs particularly well. This collection of barbecued pork recipes has something for everyone. 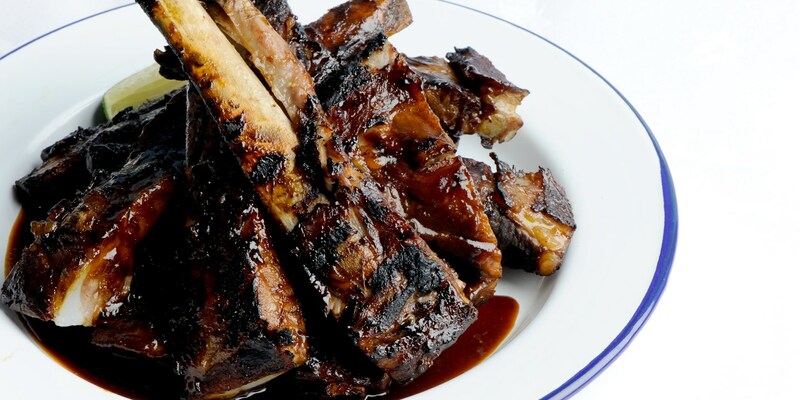 Barbecued pork ribs are one of life’s great pleasures, something our chefs know only too well: try Josh Eggleton’s Barbecued sticky ribs to get started. Barbecue pork belly is another sure-fire winner at any dinner party, as is Marcus Wareing’s Barbecued pork chop with apple and endive. Skewers are fast and easy to cook over flame; keep things high-end with Tony Fleming’s Barbecue pork belly and langoustine skewers with baby gem salad for one of the tastiest you’ve ever made. And while a little bit of salt and pepper is all that’s needed to bring out barbecued pork’s delicious flavour, marinating the meat in herbs and spices can enhance the taste, tenderise the meat and help create a delicious sweet crust.